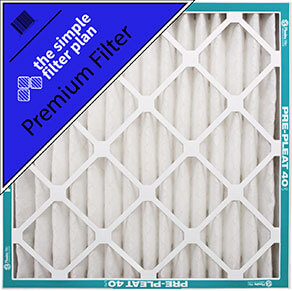 It is incredibly easy to subscribe to the air filter subscription services from Simple Filter Plan. We provide three different subscription options: Basic, Premium, and Advanced. With the Advanced home filter subscription, you get the full package of options and the best air filter we provide delivered to your home! Our Advanced filtration options can filter dust, lint, mites, pet dander, pollen, dirt, mold, smoke, smog, bacteria, virus carriers, lead dust, oil smoke, and microscopic allergens easily, preventing them from entering your home. Used in hospitals for its thoroughness in filtering, our advanced filter traps allergens are particles as small as .3 microns. Highly recommended for allergies or asthma, the advanced filter subscription is by far the most advanced, healthy, and highly-rated filter option we offer. Why consider our advanced filter? Air passes through a filter about twice a day. Without a filter, the air brings in a host of harmful particles and toxins, which you breathe in without a second thought. Our advanced filter captures the most harmful particles, protecting your lungs and your health with every intake. Each of our filters is made in the United States by the Flanders corporation, a top manufacturer of quality factors in the country. 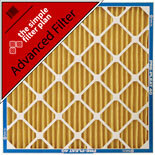 Simple Filter Plan is the easiest solution to your monthly filter replacement needs. Don’t worry about remembering to replace your air filters. With the advanced subscription option from Simple Filter Plan, your excellent filter will be sent right to your door, giving you the flexibility to change it right away. Don’t breathe in toxins because you keep forgetting to change your air filter. Learn more about our air filter subscription options, our means of delivery, and the savings you will see over time! Protect your health and the health of your family with our filter subscriptions, and breathe in healthy air. You’ve selected the Advanced Filter. If you need extra filtration due to allergies or pets, than this filter is the one for you. Looking for something else?